When it arrived in 2017, Iron Fist took a lot of heat for not having an Asian leading man in a mystical martial arts role. Turns out the Netflix/Marvel series had an ace up its sleeve: an Asian leading lady ready to take over the mantle. In a second season that has vastly improved over the first, nothing stood out more than Colleen Wing (Jessica Henwick) emerging as the new Iron Fist in the final (10th) episode. Henwick, a British actress, is the daughter of a Singaporean Chinese mother, and her father is British author Mark Henwick. It is a bold move that becomes excitedly predictable once we realize Danny Rand (Finn Jones) is not confident he's wielding the Iron Fist for all the right reasons. Danny feels like he is becoming addicted to the power of the fist and constantly looks for a reason to light it up. When his adoptive brother, Davos (Sacha Dhawan), steals the Iron Fist power from him, the fight to get that power back comes with the realization that, at least for now, someone else should be the Iron Fist. 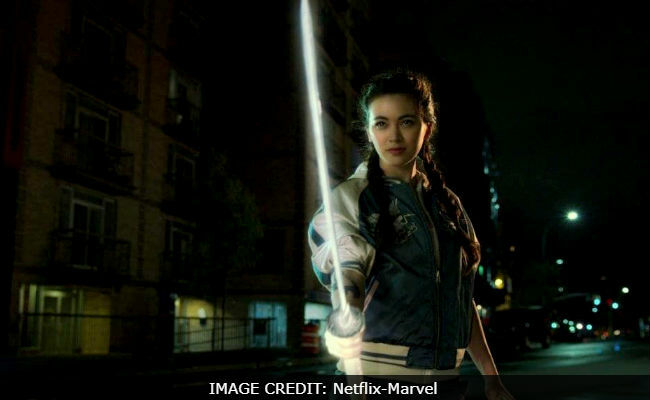 That someone is Colleen, who is now officially a vigilante in New York, fighting crime with her chi-charged glowing white fist and katana blade. If ever there was a move that more than makes up for this show continuing to not give us the yellow and green Iron Fist superhero suit, it is this one. But Colleen being the new Iron Fist is not the only thing special about the end of Season 2. Another major revelation is she may be the descendant of Wu Ao-Shi, the first female Iron Fist. "The Pirate Queen of Pinghai Bay" is mentioned this season (the tale of the first female Iron Fist was originally told in The Immortal Iron Fist No. 7. Wu Ao-Shi made her first Marvel Comics appearance in "The Immortal Iron Fist" No. 2). The story of a warrior woman and the fisherman she loved, thought by Colleen to be a fairy tale, actually happened long ago in K'un-Lun, the magical land where Danny trained and eventually became the Iron Fist. Danny is convinced Wu Ao-Shi and Colleen are connected, giving a stronger explanation of how she is able to contain the power of the Iron Fist to begin with. There is also the matter of the dead corpse - a former, suited-up Iron Fist - Davos uses as part of the ceremonial act needed to steal the Iron Fist away from Danny. With Davos defeated at season's end by a final Iron Fist blow to the ground from Colleen (and the Iron Fist power taken from him), Danny can now concentrate on who sent the dead Iron Fist body to Davos. In the season finale, Danny (and his childhood buddy Ward) are in Japan, where they name-drop Orson Randall, and let everyone know they are looking for him. That brings about gunfire, which Danny is able to deflect by pulling out two guns, charging them up with the same Iron Fist chi he's used in the past, and sending two chi-charged bullets in the direction of the gunfire and deflecting it. That chi gun trick? Iron Fist comic readers will recognize it as a trademark of Orson Randall, the World War I-era Iron Fist. Randall made his comics debut in Immortal Iron Fist No. 1. We don't see him in the season finale, but he is shaping up to be a major player next season. The mentioning of Orson Randall and Wu Ao-Shi proves Netflix and Marvel have refused to let another season of "Iron Fist" go by without looking to the best Iron Fist comic material at their disposal - something they did not do in Season 1. The comic book DNA of The Immortal Iron Fist, by writers Ed Brubaker and Matt Fraction and artist David Aja (and other illustrators), is evident this season and looks to be the main influence for the future. In our mild review of Iron Fist's first season, we mentioned a strong embrace of The Immortal Iron Fist could be the perfect remedy for what was ailing this series (we also said Henwick would make a strong Iron Fist herself). The story focuses on the discovery of Iron Fists of the past and other magic cities like K'un-Lun, each with a protector, similar to Iron Fist, who all must eventually compete in a tournament, fighting against each other. Iron Fist finally seems headed in that direction. With strong source material guiding the way and a new Iron Fist in Colleen (which isn't a part of The Immortal Iron Fist comic book story, but should be a welcome change by many fans), Davos not being dead and the potential of a Daughters of the Dragon spin-off series with Henwick and Simone Missick's Misty Knight, this show has gone from Netflix's weakest Marvel link to one that could possibly be the streaming giant's best superhero offering. Having said that, here is hoping the suit and mask finally show up in Season 3.